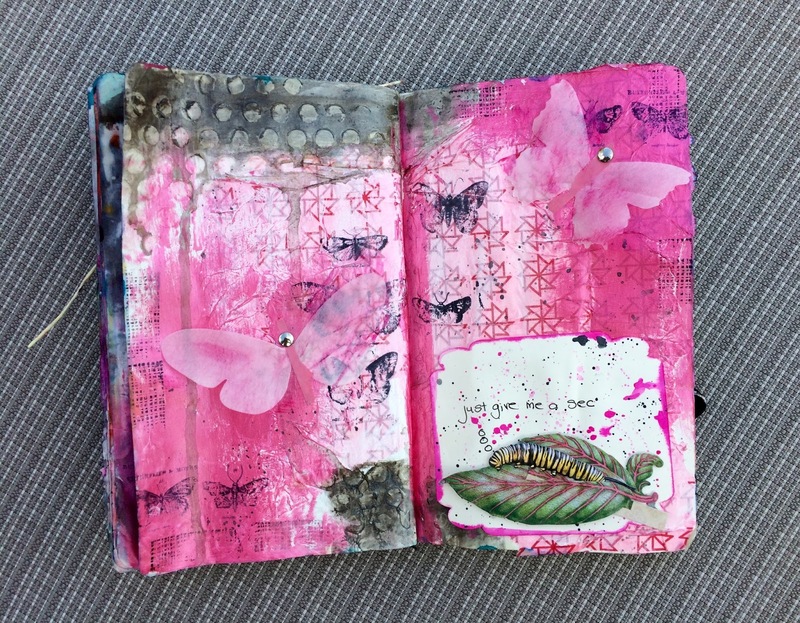 Pink Bunkadoo: It's all about the process--not the product! It's all about the process--not the product! I'm a fan girl of mixed media and especially art journaling. One thing amazing about art journaling is how relaxing it is. It's all about practice and self expression. 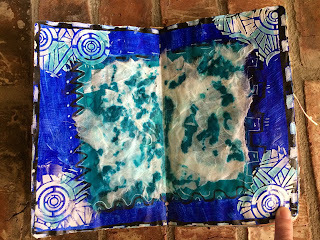 My fellow advocates of art journaling and I show finished projects to encourage and inspire you to play, but that doesn't mean we complete a spread at one sitting. This page was finished in 20 or 30 minutes. 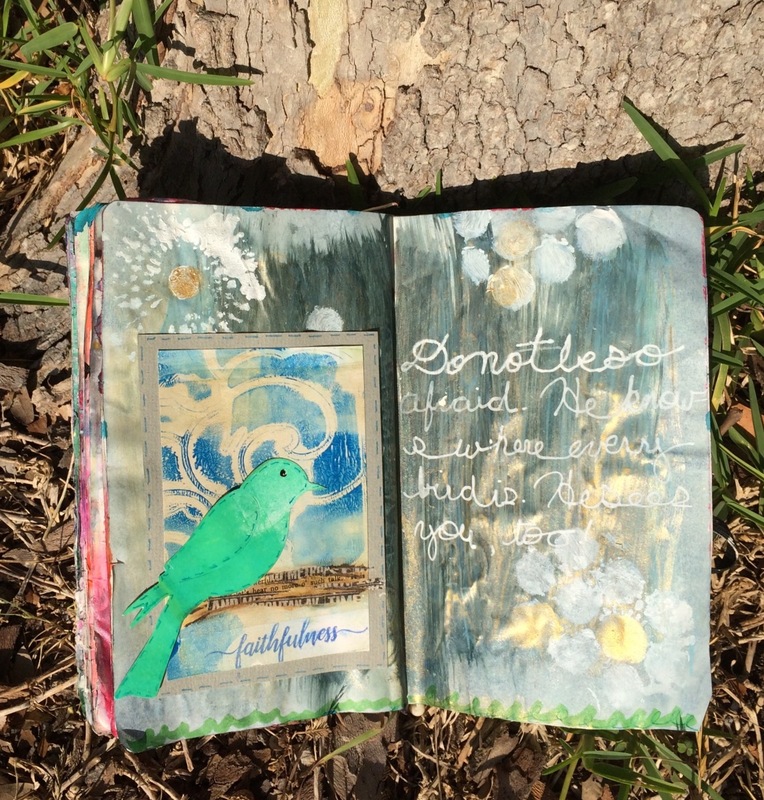 Dina Wakely and Ranger are having a mixed media challenge and this is my entry. You can find out more about this challenge by clicking here. This is one of my very favorite pieces. It is also a rare piece that comes together so easily. Let me share a different example. This spread began on March 10, 2017. I loved what I'd created. It was an excellent background with so many layers and textures without any hope of a focus. Early this week I was straightening up my drafting table when I spied this caterpillar that a lovely and encouraging friend gave me. My mind jumped to the tricky background I'd made early in the spring. Digging through my cigar box I grabbed a panel for my caterpillar. Added pink, grey, and back splashes and this background was ready to go. I never imagined a spread would have to wait so long, but it all came together and the indignant caterpillar makes me smile. 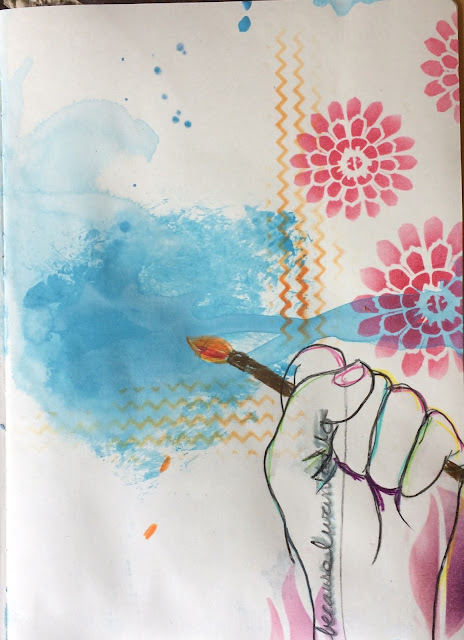 Here's an art journal page with a different journey. The background was from extra paint I brushed on from another project last winter. I really hate to waste any paint. The page was so dark, but it was compelling me to create. The subtle gold shining through was so dramatic. The same day I was cleaning my drafting table, I put some mono print pieces together. A moment of honesty: the drafty table still needs cleaning! The piece was a little big for a card so I pulled out my small art journal--a moleskine that had been repurposed. I found the metallic background and laid the bird on there. The bird found it's home. Let me encourage you to let go of the idea of a perfect product and replace it with a creative process. It's so freeing and joyful. Anyone want to help me clean my craft room? Materials: All materials either come from my Etsy Shop Pink Bunkadoo and Amazon where I buy most of my craft supplies because I live in the sticks. Fruits of the Spirit Stamp Set - 2 left in my store. Yikes!